One of the hardest things to do is starting a new project. New projects are always left with unfinished projects, which are often times pushed off to a corner and forgotten about (trust me, I’ve got several of those in a corner which I intentionally forget about). The inspiration behind this afghan is the fact that I wanted to prove to myself that I can actually read a crochet pattern and do it correctly. I’ve tried so many times, to crochet by reading the pattern instructions. That has always left me frustrated, annoyed, and many little pieces of blanket attempts in the trash. This one I plan on finishing! I am going to be my own inspiration. Please keep in mind that I am only following the written pattern, and not following the color schemes, or the yarn used. At first, I tried to use the Pipsqueak yarn, but found it too difficult to get it started. Maybe one day I will try this pattern with Pipsqueak yarn. For now, a simpler, softer yarn will be easier for me. I went 4 more rounds and added my second row of off white. By the time I had finished the second round, I was so excited that I decided to get comfortable on the couch, and crochet the night away. After the 4 rounds, I decided to go 8 more rounds of the pattern before adding another round of off white. I am now pretty stuck. 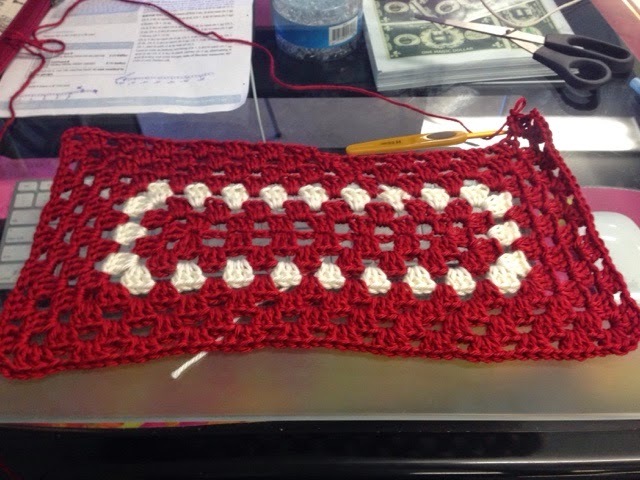 After working on my blanket and getting stuck for a while, I decided to finish off the blanket with 14 rounds of red yarn and giving it a nice white finished edge.